Samuel Joseph “Sam” Price, age 91 years, a resident of Elkins, WV departed this life Saturday morning, March 23, 2019 at the Elkins Rehabilitation & Care Center at Elkins, WV surrounded by his loving family and under the care of Mountain Hospice. He had been in declining health. He was born Sunday, April 17, 1927 at Paden City, WV a son of the late Samuel Bowen and Sarah Elizabeth Kernan Price. On May 1, 1945, he was married to the former Wanda Lee Weekley, who survives. Also surviving are one son, Samuel “Kent” Price and wife Cindy of Elkins; one daughter, Beverly Jo Hoover and husband Randy Moore of Elkins, five grandchildren, Nicka Robinson and husband Doug, S. David Price and wife Pamela, Raymuth Price and wife Andrea, Lynn Cooper and husband Richard, and Susan Hoover; twelve great grandchildren; and one niece. Preceding him in death are two sisters, Beatrice Marie Vogel, and Peggy Ann Kearns; and two granddaughters, Mary and Sarah Eva. He attended Sistersville High School, attended West Liberty College and was a veteran of the U. S. Navy serving during World War II located at San Pedro, CA working at the separation center. He had worked for the Tyler Star-News at Sistersville where he learned his printing trade. He went on to work for the Wheeling Intelligencer, and later the Cleveland Press. In 1962 he moved to Elkins and purchased The Printcrafter’s from which he retired in 1998. He was a member of Elkins Lodge # 108, A.F. & A.M., the Elkins Chapter # 35, Royal Arch Masons, the Pilgrim Commandery # 21, Knights Templar, and was the State Grand Commander of the Knights Templar of WV during 2008-2009 and the Randolph Chapter # 74, Order of the Eastern Star. 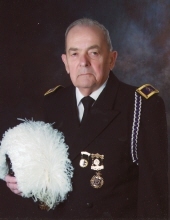 He was a member of the H. W. Daniels Post # 29, American Legion, the Tygarts Valley Post # 3647, Veterans of Foreign Wars, was a founder and elder of the First Christian Church of Elkins. He loved the outdoors, was an avid hunter and was well-known for his 1922 Stanley Steamer. The family will receive friends at the Lohr & Barb Funeral Home of Elkins from 5 to 7 PM, Tuesday. Final Rites will be conducted at the funeral home, Wednesday, March 27, 2019 at 1 PM. S. Kent Price, Minister will officiate and interment will follow at the Maplewood Cemetery at Elkins, WV where the U. S. Navy, the H. W. Daniels Post # 29, American Legion and the Tygarts Valley Post # 3647, Veterans of Foreign Wars will conduct full military honors and the Elkins Lodge # 108, A.F. & A.M. will conduct Masonic Graveside Rites. The family suggests that expressions of sympathy be in the form of contributions to the Charity of your Choice. To send flowers or a remembrance gift to the family of Samuel Joseph "Sam" Price, please visit our Tribute Store. "Email Address" would like to share the life celebration of Samuel Joseph "Sam" Price. Click on the "link" to go to share a favorite memory or leave a condolence message for the family.